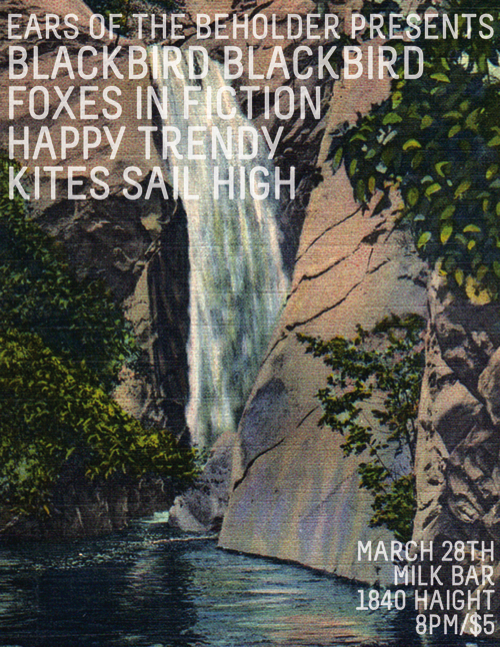 Keeping the SXSW afterglow alive, fellow blogger and Austin music buddy, Ears of the Beholder, has whipped up a great showcase this Monday, March 28 at Milk Bar featuring local up and comers Blackbird Blackbird and Kites Sail High along with two Canadian bands Happy Trendy and Foxes in Fiction. Tune in and chill out. RSVP here. This entry was posted in Shows and tagged blackbird blackbird, ears of the beholder, foxes in fiction, happy trendy, kites sail high. Bookmark the permalink.